"In the final weeks of the US presidential election, Veles attained a weird infamy in the most powerful nation on earth; stories in The Guardian and on BuzzFeed revealed that the Macedonian town of 55,000 was the registered home of at least 100 pro-Trump websites, many of them filled with sensationalist, utterly fake news. (The imminent criminal indictment of Hillary Clinton was a popular theme; another was the pope's approval of Trump.) The sites' ample traffic was rewarded handsomely by automated advertising engines, like Google's AdSense. An article in The New Yorker described how President Barack Obama himself spent a day in the final week of the campaign talking 'almost obsessively' about Veles and its 'digital gold rush.'" 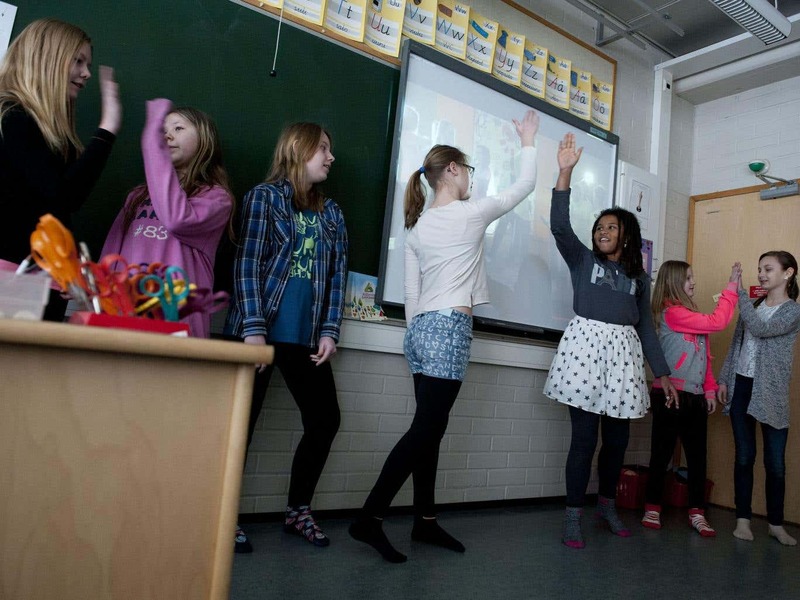 "Finland is about to embark on one of the most radical education reform programmes ever undertaken by a nation state – scrapping traditional 'teaching by subject' in favour of 'teaching by topic'. Subject-specific lessons – an hour of history in the morning, an hour of geography in the afternoon – are already being phased out for 16-year-olds in the city’s upper schools. They are being replaced by what the Finns call 'phenomenon' teaching – or teaching by topic. For instance, a teenager studying a vocational course might take 'cafeteria services' lessons, which would include elements of maths, languages (to help serve foreign customers), writing skills and communication skills. More academic pupils would be taught cross-subject topics such as the European Union - which would merge elements of economics, history (of the countries involved), languages and geography. Finnish schools are obliged to introduce a period of 'phenomenon-based teaching' at least once a year. These projects can last several weeks. In Helsinki, they are pushing the reforms at a faster pace with schools encouraged to set aside two periods during the year for adopting the new approach. Ms Kyllonen’s blueprint, to be published later this month, envisages the reforms will be in place across all Finnish schools by 2020." 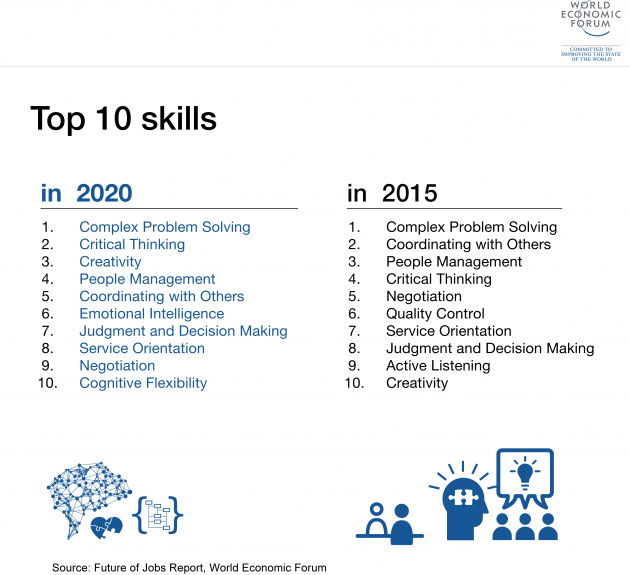 "By 2020, the Fourth Industrial Revolution will have brought us advanced robotics and autonomous transport, artificial intelligence and machine learning, advanced materials, biotechnology and genomics. These developments will transform the way we live, and the way we work. Some jobs will disappear, others will grow and jobs that don't even exist today will become commonplace. What is certain is that the future workforce will need to align its skillset to keep pace. A new Forum report, The Future of Jobs, looks at the employment, skills and workforce strategy for the future." "Sustainability is one of the guiding principles underpinning Macquarie's graduate capabilities framework. Sustainable learning and teaching is an inclusive concept that emphasises participation, resource sharing, mentoring, collaboration and lifelong learning. The Sustainable Learning and Teaching project demonstrates ways of embedding the principle of sustainability and associated graduate capabilities in the curriculum. The project consists of a series of short videos produced and directed by Mark Parry featuring Macquarie University staff, students, alumni and the broader community. The videos are underpinned by research–based resources developed by Anna Rowe, including an annotated bibliography and teaching strategies for sustainable learning outcomes and assessment tasks. The project was led by Agnes Bosanquet and funded by Macquarie University Sustainability." "Personalising learning is... ...learner–centred and knowledge–centred: Close attention is paid to learners' knowledge, skills, understanding and attitudes. Learning is connected to what they already know (including from outside the classroom). Teaching enthuses pupils and engages their interest in learning: it identifies, explores and corrects misconceptions. Learners are active and curious: they create their own hypotheses, ask their own questions, coach one another, set goals for themselves, monitor their progress and experiment with ideas for taking risks, knowing that mistakes and 'being stuck' are part of learning. Work is sufficiently varied and challenging to maintain their engagement but not so difficult as to discourage them. This engagement allows learners of all abilities to succeed, and it avoids the disaffection and attention–seeking that give rise to problems with behaviour. ...and assessment–centred: Assessment is both formative and summative and supports learning: learners monitor their progress and, with their teachers, identify their next steps. 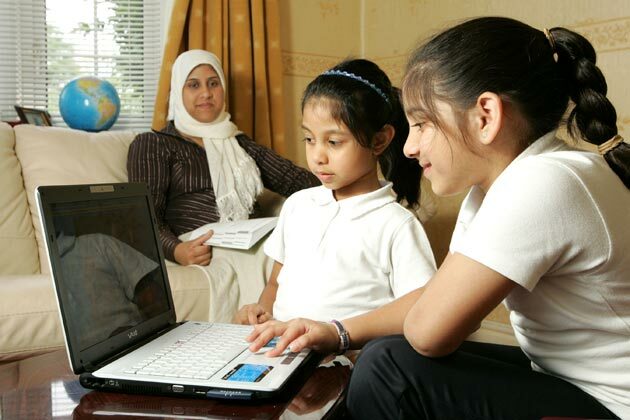 Techniques such as open questioning, sharing learning objectives and success criteria, and focused marking have a powerful effect on the extent to which learners are enabled to take an active role in their learning. Sufficient time is always given for learners' reflection. Whether individually or in pairs, they review what they have learnt and how they have learnt it. Their evaluations contribute to their understanding. They know their levels of achievement and make progress towards their goals. Stimulated by How people learn: brain, mind, experience and school (Bransford, J. D., A. L. Brown, et al.)." Bransford J.D., Brown A. L. and Cocking R. (eds. ), How people learn: brain, mind, experience and school, National Academy Press, Washington DC, 2000. 1). Teaching and Learning in 2020 Review Group (2007). '2020 Vision: Report of the Teaching and Learning in 2020'. Department for Education and Skills.